Do I put whipped cream on everything? No. Really, no, but apparently I do it put it on almost everything that goes on my blog. 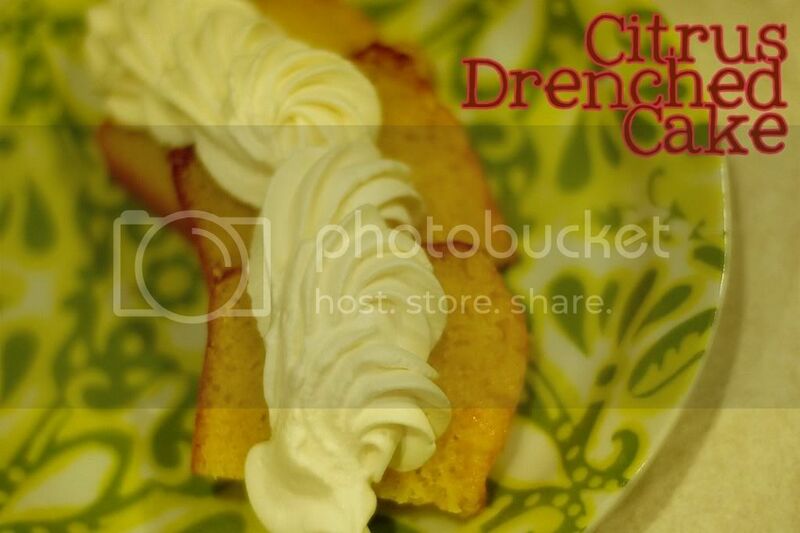 And of course, whipped cream was a delicious accompaniment to my loose adaptation of Dorie's Rum Drenched Vanilla cake (thanks for the great choice, Wendy!) After ten too many trips to the store, I opted to make do with what was in the kitchen, so my halved version of the recipe doesn't include the rum, the vanilla bean, or even the cream (except on top- I thankfully had some of that in the fridge!) It does have lots of zest and fresh juice. It's delicious. Just make sure you don't underbake it, like I have a tendency to do! Center a rack in the oven and preheat the oven to 350. Butter a 8 1/2-x-4 1/2-x-2 1/2 -inch loaf pan, dust the inside with flour and tap out the excess. Place the pan on an insulated baking sheet or on two regular sheets stacked one on top of the other. Put the sugar and the lemon zest in a large bowl and, working with your fingers, rub them together until the sugar is moist and fragrant. (If you are using vanilla extract, add it later, after you’ve added the eggs.) Add the eggs and whisk them into the sugar, beating until they are thoroughly incorporated. Whisk in the extract, if you are using it, then whisk in the cream, followed by the rum. Continuing with the whisk or switching to a large rubber spatula, gently stir in the dry ingredients in 3 or 4 additions; the batter will be smooth and thick. Finish by folding in the melted butter in 2 or 3 additions. Pour the batter into the pans, smoothing the tops with a rubber spatula. Meanwhile, Make the Syrup: Stir the water and sugar together in a medium saucepan over medium heat until the sugar melts, then bring to a boil. Remove the pan from the heat and stir in the juice. Pour the syrup into a heatproof bowl and let cool. When the cake tests done, transfer to a wire rack to cool for 5 minutes before unmolding and turning right side up on the rack. Place the rack over a baking sheet lined with wax paper and, using a thin skewer, cake tester or thin-blade sharp knife, poke holes all over the cake. Brush all over with the syrup, working slowly so that the cake sops it up. Cool to room temperature. Citrus drenched sounds so good right now. Your cake turned out perfectly. ooOOOOOoooo citrus would be soooo wonderful with this cake. You used orange. I did lemon. I am sure yours was delicious. Anne, that cake looks lovely, and it's good to know the orange version is delicious, too! This looks so delish! Loving the use of citrus...WOW! I used orange too - loved it! And whipping cream is perfect for this cake - love your presentation - so fun! the whipped cream spirals look perfect! Citrus drenched sounds amazing! You know, I'm not a fan of whipped cream but every time I see you use it, it looks good to me. YUM!! Lemon. Nothing wrong with that. Love the whipped cream on top. you achieved a beautiful golden color! Fabulous citrus! I just did vanilla bean. It wasn't my favorite, but everyone that had some LOVED it. The orange sounds de-lish to me, especially if it's drenched! very cool indeed. How inventive! I want to try a citrus version one day. It sounds delicious. Thanks for baking along with me this week! 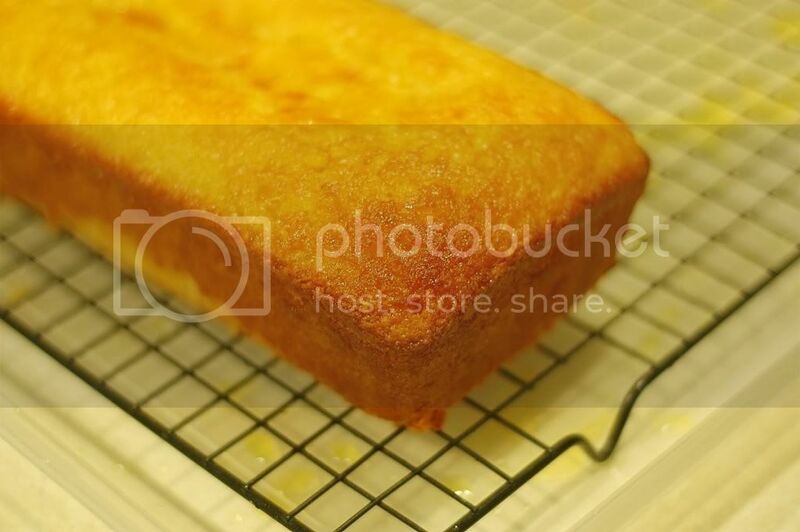 I love lemon cake, and this looks delicious! Looks delicious! I think under-baked is better than over-baked any day!